On Thursday, Aurel Bacs, Toby Bateman and Wei Koh joined director Paul Feig for an evening of fine watch discussion at Phillips’ auction house in London. One could be forgiven for momentarily lapsing into bouts of navel-gazing (or more literally, wrist-gazing) last Thursday as watch aficionados descended upon Phillips auction house on Berkeley Square in London to listen to an expert panel espouse their thoughts and opinions on the irrevocably intertwined subjects of timeless watches and men's style with a view to Phillips' upcoming 'Styled' auction in December. 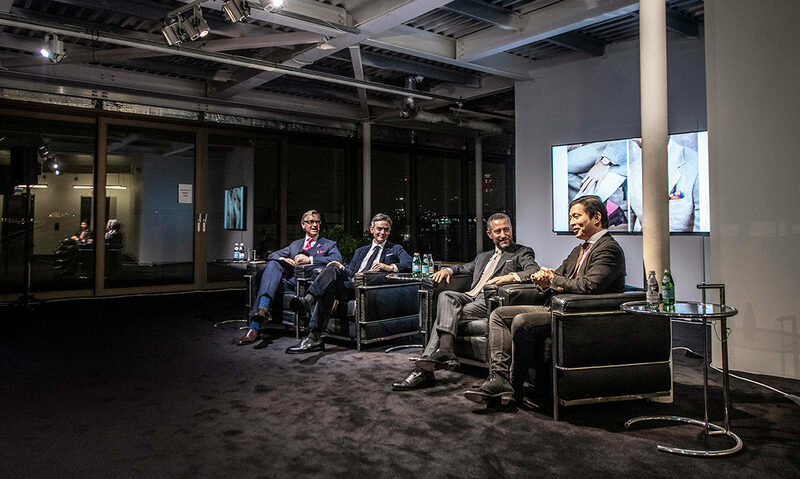 Chaired by the esteemed film director Paul Feig, the panel, which consisted of the founder of Bacs & Russo, one Aurel Bacs (the man who sold the most expensive wristwatch in the world), Mr Porter's Managing Director Toby Bateman, and The Rake's founder Wei Koh, opined on many a topic, including their favourite watches, which timepieces they would take to a desert island, why watches have become such an important element in the modern man's oeuvre of style, and of course, the auction itself on December 5th in New York, which will see the serious business of 121 of the most collectable watches in the world go under the hammer at Phillips' auction house in New York. Time was very much of the essence. On Thursday, however, business was far from everyone's minds as the panel discussion got underway. Brilliantly hosted by Paul Feig, the discussion shed light on the dual worlds of watch collecting and menswear. Although it is rare for these two industries to meet in any significant way, even just a cursory glance at the attendees that evening would have lead you to believe that fine watches and elegant style go very much hand in hand. And why shouldn't they? There is perhaps no better way to sign off your look than with the timepiece on your wrist, especially if it is somehow significant. But as the panel stated, a significant watch worn carelessly simply becomes a bit of expensive real estate, a jarring bookend to an ill-conceived outfit. Style and watches are symbiotic by nature and so how they interact needs to be carefully considered. This is the premise behind the 'Styled' auction, for which both Mr Porter and The Rake have curated 12 unique looks that define the most important style moments in a man's life. The 121 watches up for auction will move from London today to New York where they will be exhibited at Phillips until the gavel's first strike on December 5th. If you're in Hong Kong between 22-26 November, you'll also be able to view highlight pieces from the auction at the Mandarin Oriental Hotel between 10am and 6pm. To stay tuned with all the news around the event, follow @therake, @phillipswatches and @mrporterwatches on Instagram or search for #StyledAuction. Otherwise, visit Phillips.com/Watches for in-depth information on the lots and auction details.